Daughtry seems to be in the midst of a musical identity crisis. 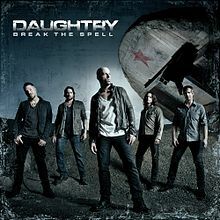 Recently, Chris Daughtry proclaimed his band’s latest would sound completely different from its predecessors, but by the album’s second track, you will realize Break the Spell doesn’t live up to that promise. Instead, what you get here is more of the same: radio friendly pop ballads mixed with arena style rockers. This recently released third entry into Daughtry’s discography is not as musically disparate or engaging as 2009’s Leave This Town, which was an appealing blend of rock, pop and country flavors. Blasting off with the disc’s heaviest and hardest rocking tune “Renegade,” and immediately followed by the paint-by-numbers, pop-rock single “Crawling Back To You, ” expectations are instantly eschewed that an all-out rock assault is about to ensue. Daughtry’s intention to diversify towards authentic rock comes off sounding cliché, and generic. Plagued with trite lyrics scattered throughout, such as “My heart, I wear it on my sleeve,” “Like a moth into a flame,” and “There’s part of you keeping me alive,” this set too often shifts back and forth between overly maudlin and just plain sappy. With that said, Break the Spell does have some captivating and memorable moments. For example, the Bon Jovi-sounding rocker “Outta My Head,” and power ballad “Crazy,” are among the best of the lot. Also, the mid-tempo “Start of Something Good,” and the solemn “Gone Too Soon,” are worthy examples of Chris Daughtry’s ample songwriting talent, and are easily the album’s strongest offerings. Regrettably, Break the Spell never fulfills its mission of delivering an unabashed rock effort and genuine nuggets of musical magic are few and far between. Perhaps the band should consider severing ties with long-time producer Howard Benson and pursue other collaborators before its next release, as the spell apparently has been broken.